With today’s new driving laws in place and our current busier than ever life style choices, hands-free car-kits are becoming more and more important. The Parrot Mki9100 is an easy and excellent solution to this problem! 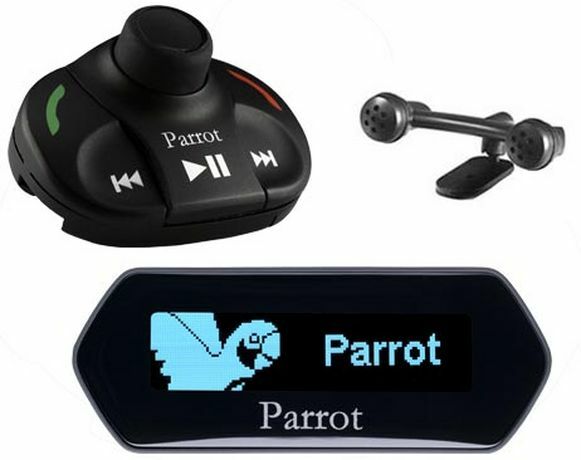 The Parrot Mki9100 is an advanced Bluetooth hands-free car-kit that works with iPhone and made for iPod use. Once paired with your Bluetooth mobile phone, the MKi enables you to establish in a few seconds any phone conversations in your vehicle without needing to handle the telephone, even leaving it in your pocket. Connection with your mobile is made in a completely transparent way. The Parrot MKi kits connect to your car audio system and deliver hi-quality conversations whatever the conditions are. Each MKi kit is delivered with it independent RF remote control. Positioned on the steering wheel or placed wherever is convenient, the remote control gives you the total control you need right at your fingertips. The Parrot MKi kits propose an incredibly efficient combination of an external double microphone and new software which eliminate environmental and in-car noises with full-duplex and zero-echo crystal clear conversations.Another unique feature: the screen of the MKi9100 is detachable from its support when you leave your vehicle, for ultimate security. The remote control gives you access to the main functions: PLAY, PAUSE, NEXT SONG, PREVIOUS SONG, and VOLUME. The MKi9100 displays the playlist for you to always visualize what is played. All music files are played back on the car’s speakers (front and back) while the MKi built-in digital amplifier transforms your car into a true concert hall! The MKi automatically synchronize the names and phone numbers in your mobile with their phonebooks and updates the phonebooks each time a new entry is detected. The software of the MKi is upgradeable for free at any time from our web site. And to benefit a higher integration in the vehicle, MKi can be interfaced with an optional module – Parrot MULTICAN – which uses the existing steering wheel mounted commands to control your Parrot Bluetooth hands-free car kit. There is no additional visible part to install; it only uses the existing car’s steering wheel control buttons. You keep controlling the car radio from the steering wheel and if the steering wheel doesn’t have enough buttons, the Parrot MULTICAN uses a specific combination of buttons to compensate for the missing ones. At least a fully invisible Bluetooth hands free solution! The Bluetooth wireless technology enables voice and data to be sent via a shortdistance radio link. It connects a wide range of electronic equipment without requiring additional cables. Furthermore, it extends the communication possibilities for mobile phones and a large number of devices. The Bluetooth stereo (A2DP) profile uses the same radio frequencies and can be used to send music tracks from one device to another.